"Flowers and Butterflies Bib " is a coloured cross-stitch chart (very easy to follow) with instructions translated in English. It comes with a complete alphabet for you to personalize your work. The text of the design has been translated to allow you to stitch it in French or in English. Special stitches: This is a pure cross-stitch design with a few back stitches for the butterfly’s antennas and the flowers' stems. This pattern shows 8 colours (DMC references on the chart). The model on the picture has been stitched on a 40 count linen bib made in France using two strands of cotton over two threads of fabric. 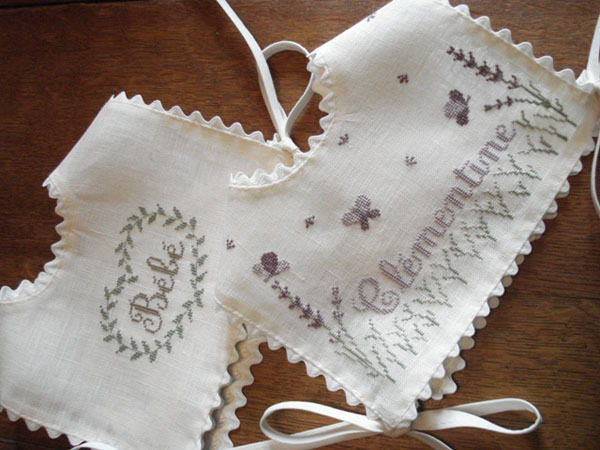 Recommended Fabric: None, you may stitch these patterns on the fabric of your choice; should you be interested in the 40 count linen bib shown on the picture, please contact us.